A bosun’s chair is the most popular way to climb your sailboat’s mast, if you need to change a bulb in your masthead light, retrieve a lost halyard or perform any one of a number of rig maintenance tasks. 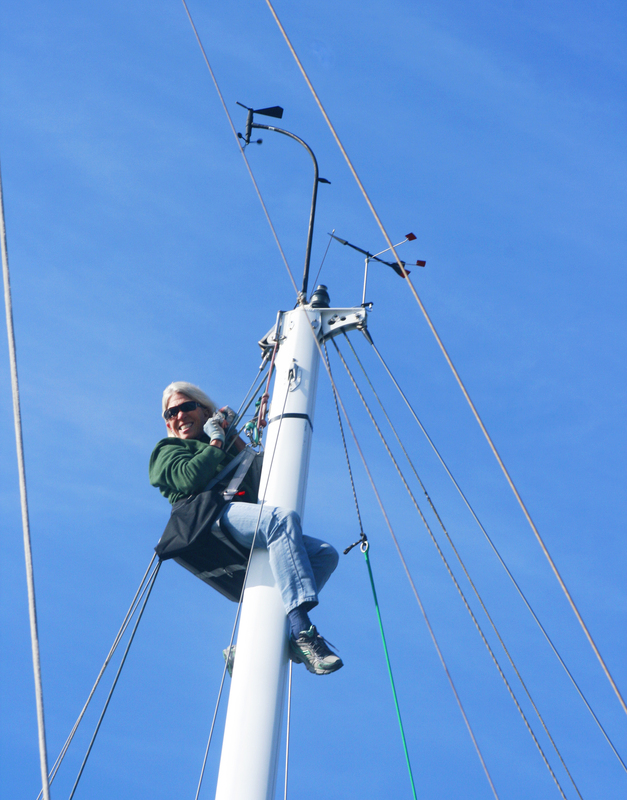 Bosun’s chairs are comfortable and you can sit in them for a long time, so they make working on the mast easy. You don’t need to be burly to go aloft in a chair. Here is Kitty, a petite former firefighter with no fear of heights, unlike the author! Winching her to our masthead with a #48 primary winch is a breeze. They require less physical strength from the aerial crew than the alternative climbing style, the ATN Mastclimber. Instead, the heavy lifting is done at cockpit level by a muscular “deck ape” grinding a winch. We explain how the Mastclimber works in this West Advisor article. 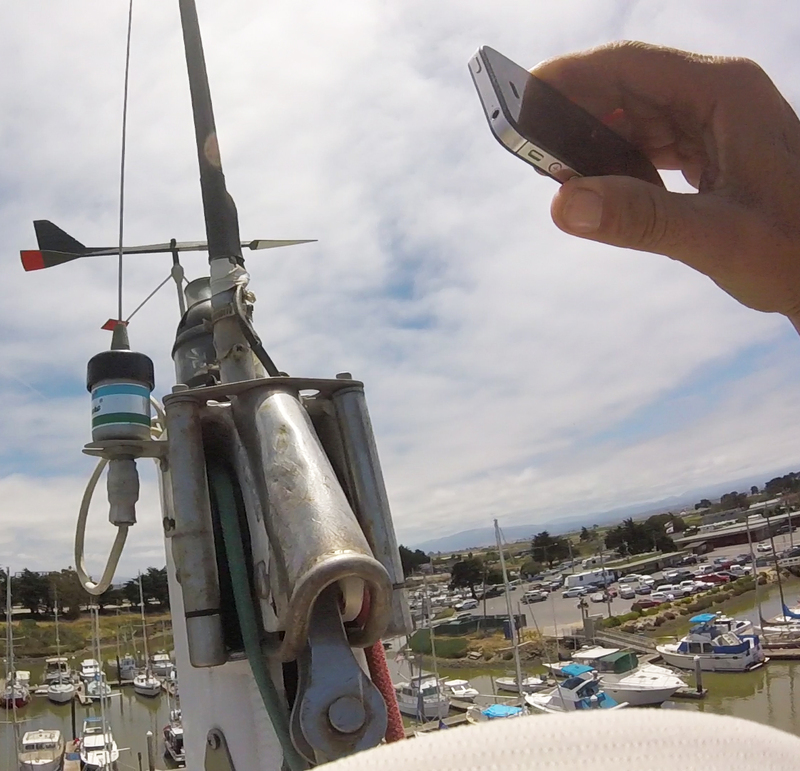 In today’s essay, we’re going to show you the best way to go up your mast safely using a chair. To get the details from a professional, I have checked in with Mark Chandler, West Marine Rigging’s OEM Manager and Grand Prix Specialist. 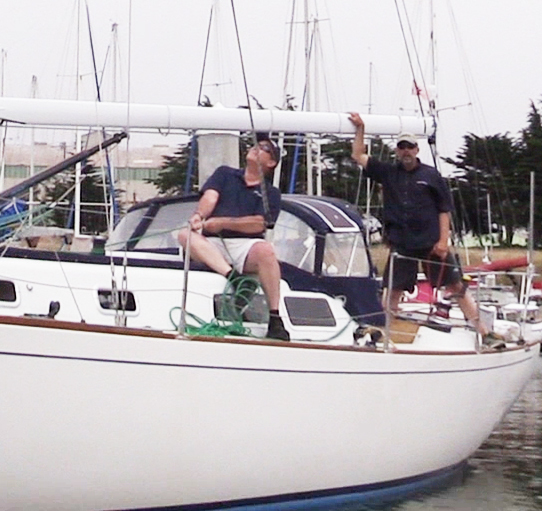 Mark shares his pro tips while climbing my Cal 40 rig in a Harken Premium Bosun’s Chair. If you’re using our West Marine Premium Bosun’s Chair or one of the other excellent models we carry, the process is exactly the same. To use a bosun’s chair, you need to follow some basic safety precautions. Inspect the chair, and look for wear or abrasion to the webbing, cut or worn threads and damage or fatigue to triangle attachment points. Don’t use a chair that is suspect in any way. Make sure the chair is adjusted so you fit snugly and comfortably in it and are well secured so that a fall is impossible. The waist strap fits through the crotch strap. 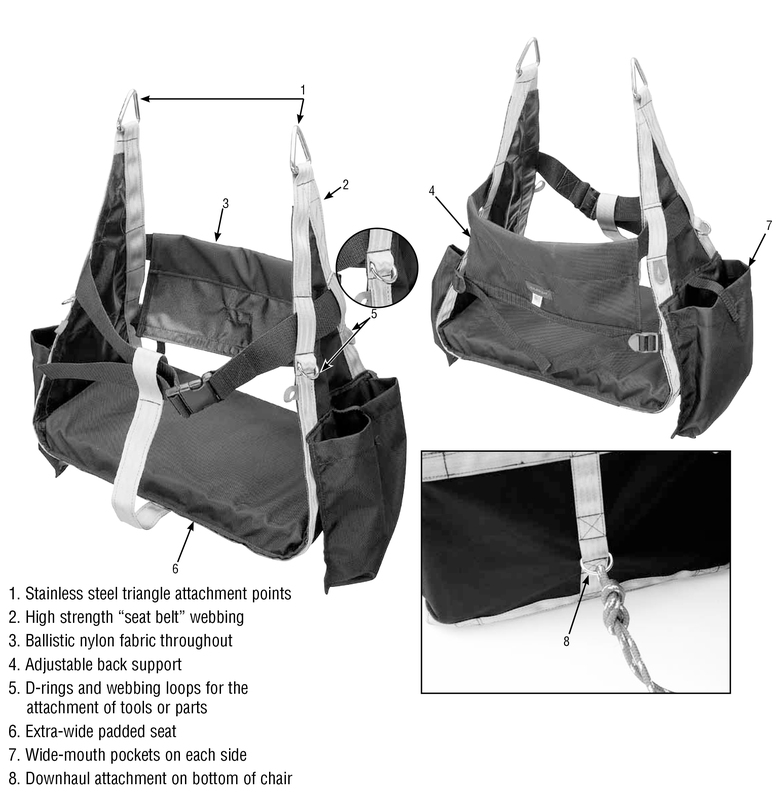 Tighten the Adjustable Back Support, which is critical for keeping you inside. Attach your tools such as wrenches to one of the D-rings with a lanyard, so you won’t drop them, causing damage or injury. Instruct your crew working on the deck to never stand directly under the person who is aloft. Never go up the rig of a sailboat when it’s hauled out of the water and supported on jack stands. The weight of a person, combined with the leverage of the long spar, could cause the boat’s supports to kick out with disastrous consequences. 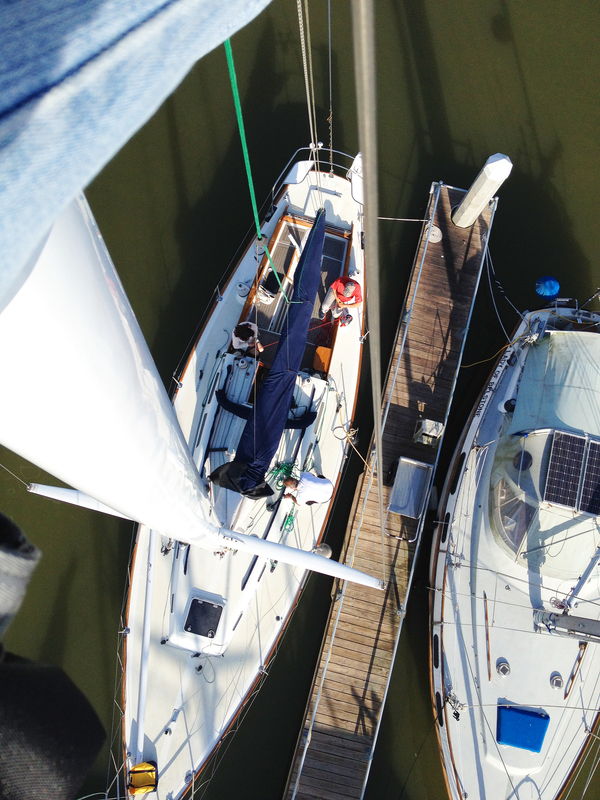 Here we’re using two halyards. Brian is using the green secondary halyard, while I’m working the red primary halyard from the cockpit as we ease Mark gently and smoothly down. Do you always need two halyards? We’ve seen many Grand Prix racing boats sending one of their crew up the rig using a single halyard, but these are professionally maintained craft. Their rigging and hardware are pampered and the teams have high confidence in every line and sheave. Plus, their crew sends a person up the rig and back down in a hurry, performing a single task, often in the middle of a race. 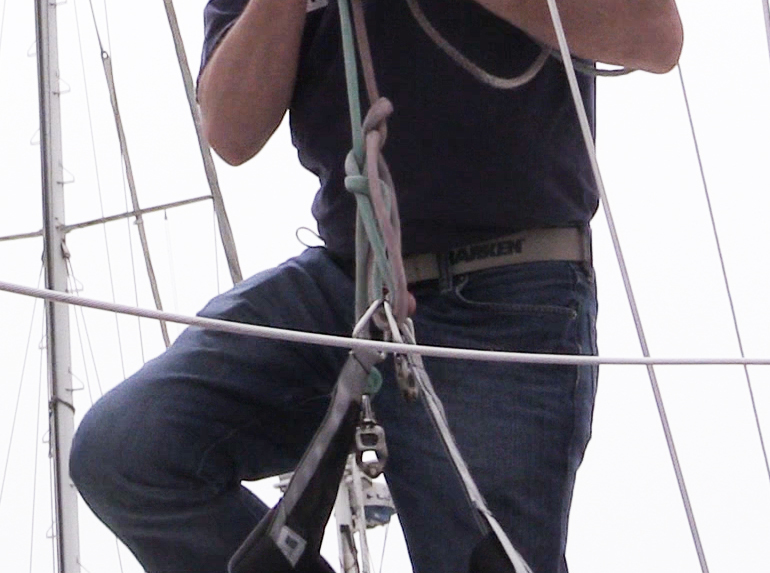 Experts like Mark Chandler wear a climbing harness, such as the Spinlock Deckware Mast Harness. Mark and other authorities don’t advise this for the average recreational sailor. Instead, you always use one of your halyards to hoist you up the rig, but you also need a backup halyard. Get assistance from two helpers down on deck. One person will operate the primary halyard; another will work the second, backup halyard. On our boat, we lead the primary halyard back to our biggest Harken #48 cockpit winch, and use a 10” winch handle for maximum leverage. Our strongest grinder operates that winch and communicates with the person aloft. The secondary halyard is merely a safety line. Its operator just takes up the slack without needing a winch handle, maintaining enough wraps on the winch to prevent a fall if the primary halyard should break. Mark Chandler never relies on shackles or splices (even his own). Attach both halyards with bowline knots, as shown. Snap shackles are subject to stress corrosion and can fail under load or suddenly spring open. Overloading is not always apparent, especially with high-load stainless steel alloys such as Type 17-4. 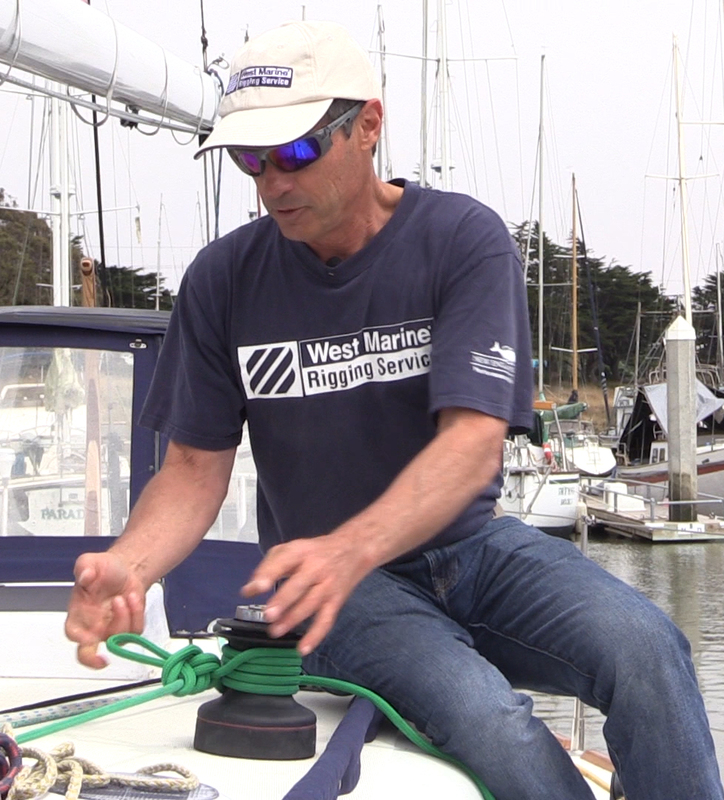 Instead of risking the use of a shackle or splice in a halyard, Mark advises to always tie bowlines. Locate them several inches up the halyard, since the line will tend to fatigue near the shackle, where it spends time making a highly loaded turn around the sheave at the masthead. If you have doubts about either or both of your halyards, swap the suspicious line for another halyard that’s new and strong. Mark brings his own line to a Customer’s boat for this purpose. Mark bounces hard up and down to tension the bowlines and test the halyards. He hangs on in case something breaks, so he won’t tumble on his rear end. Before you go up, aggressively bounce-test your setup, as shown in the photo. Be careful to keep your weight centered over your feet, so if the system lets go, you won’t fall hard on your rear end. This shock loading will ensure your safety, and also take some of the stretch out of the halyards. The time to break any components, like halyards, bolts holding a winch, or the axle of a sheave at the masthead, is right now! Just in case someone comes by and tries to remove your halyards from the winches, you should tie them as shown. Tie both the primary and secondary halyard the same way. When the halyards are hoisted to the masthead, Mark ties them around the winches as shown at right. This may seem like overkill, but what if your pair of deck assistants goes to the car for a tool or are below deck while you’re quietly lubricating some rod rigging at the masthead? If some clueless person should walk up to the boat and decide to remove the halyard from the winch, this method, used for both halyards, would hopefully prevent a catastrophe. Lowering the climber down with abrupt and jerky motions is a common mistake by the winch operators. This is really tough on the person in the bosun’s chair. When they reach deck level, you’ll often see a wide-eyed expression of fright on their face. Mark says, “It’s a little heart-stopping when you come to a quick halt!” Instead, take one wrap off the winch and ease the person down smoothly and gently. 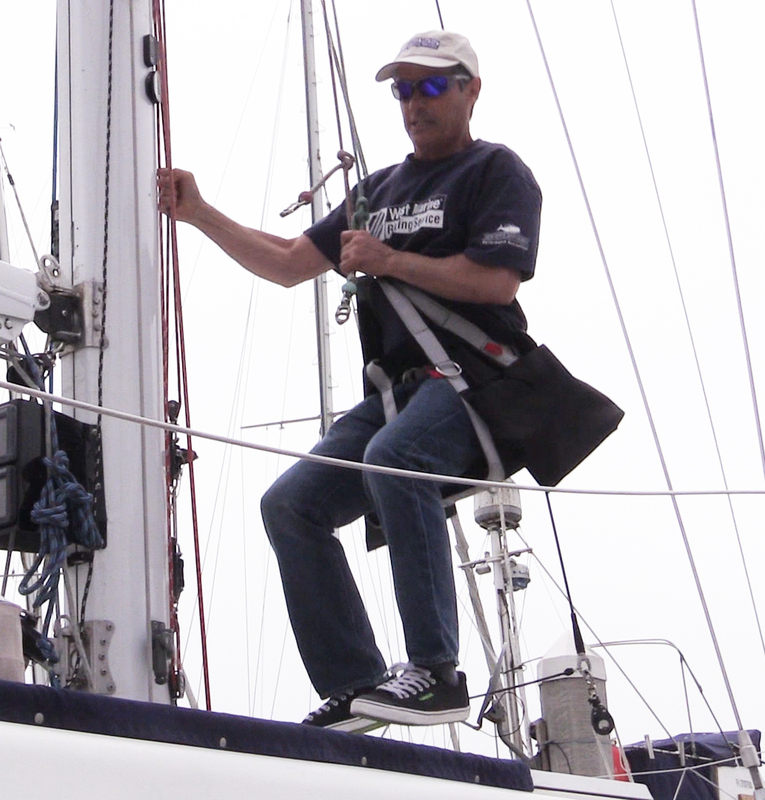 As he’s being raised or lowered, Mark says, “I tend to hold onto two things, instead of just the mast. If the boat’s moving around, it keeps you more stable.” He will grab onto shrouds, spreaders or a taut halyard. He wears a pair of grippy rubber-soled Zhik ZKG deck shoes for good traction on the surface of the mast. Mark holds on and keeps his hands clean by also wearing a pair of Boss Tech™ Gloves. The upper regions of a sailboat’s rig never get washed, and tend to be quite dirty. He carries a rag in one of the bosun’s chair pockets to wipe down gritty hardware. Bring your smartphone to document the condition of rigging hardware. “The last trick,” Mark uses when lowering someone to the deck, ”is to make sure that you go down far enough so you can get out of the chair.” The winch operator should pay attention as the climber lands on their feet, and then ease the chair down so they can step out. Mark carries all of his tools and gear in the chair’s pockets, such as screwdrivers, wrenches, metal polish, a rag, rigging tape or electrical tape, Tef Gel® and a brush. He keeps a lightweight messenger line, so helpers can send up a tool, or he can lower a masthead light for disassembly and bulb replacement. He keeps his iPhone in his pocket to shoot close-ups of hardware for later detailed inspection. Pros like Mark Chandler at West Marine Rigging Service are ready with rigging solutions for your traditional sailboat, offshore cruiser, club racer, high-tech dinghy or Grand Prix raceboat. You can also take some incredible pictures. Harken’s Owners Manual illustrates typical bosun’s chair components.